For other uses, see Kmart (disambiguation). For the separate Australian company, see Kmart Australia. 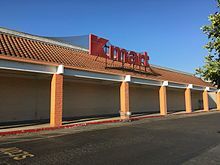 Kmart Corporation (/ˈkeɪmɑːrt/ KAY-mart, doing business as Kmart and stylized as kmart) is an American big box department store chain headquartered in Hoffman Estates, Illinois, United States. The company was incorporated in 1899 as S. S. Kresge Corporation and renamed to Kmart Corporation in 1977. The first store with the Kmart name opened in 1962. At its peak in 1994, Kmart operated 2,323 discount stores and Super Kmart Center locations in the United States. After declaring bankruptcy in 2002 and again in 2018, the chain's store count has been reduced to 202 locations. From 2005 through 2019, Kmart was a subsidiary of Sears Holdings Corporation and is now a subsidiary of Transform Holdco LLC. S. S. Kresge, the founder of the company that would become Kmart, met variety-store pioneer Frank Winfield Woolworth while working as a traveling salesman and selling to all 19 of Woolworth's stores at the time. In 1897 Kresge invested $6,700 saved from his job into a five-and-dime store in Memphis, Tennessee. He jointly owned the first store with his former tinware customer, John McCrory. 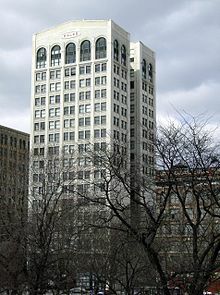 Kresge and McCrory added a second store in downtown Detroit the following year. These were the first S.S. Kresge stores. After two years of partnership, he traded McCrory his share in the Memphis store, plus $3,000, for full ownership of the Detroit store, and formed the Kresge & Wilson Company with his brother-in-law, Charles J. Wilson. In 1912, Kresge incorporated the S.S. Kresge Company in Delaware with eighty-five stores. In 1916, Kresge incorporated a new S.S. Kresge Company in Michigan and took over the operations of the original company; the new company in Michigan is the modern day Kmart company. The company was first listed on the New York Stock Exchange on May 23, 1918. During World War I, Kresge experimented with raising the limit on prices in his stores to $1. By 1924, Kresge was worth approximately $375 million and owned real estate of the approximate value of $100 million. [better source needed] Growth early in the 20th century remained brisk, with 257 stores in 1924, rising to 597 stores by 1929. Kresge retired as president in 1925. The Great Depression reduced profitability and resulted in store closings, with the number rising to 682 in 1940. After the war, shopping patterns changed and many customers moved out of the cities into the suburbs. The Kresge Company followed them and closed and merged many urban stores; by 1954, the total number of stores in the US had declined to 616. Kmart's original logo used until 1990. This logo was also used by Kmart Australia from 1969 until 1991. Under the leadership of executive Harry Cunningham, S.S. Kresge Company opened the first Kmart-named store on March 1, 1962, in Garden City, Michigan, just four months before the first Walmart opened. Eighteen Kmart stores opened that year. Kmart Foods, a now-defunct chain of Kmart supermarkets, opened in that decade. Though the store chain continued to open Kmart branded stores, the store chain was still officially called S.S. Kresge Company. Company founder Kresge died on October 18, 1966. Around the time of the opening of the first Kmart, some poorly performing S.S. Kresge stores were converted to a new "Jupiter Discount Stores" brand, which was conceived as a bare-bones, deep discount outfit. During the 1970s, Kmart put a number of competing retailers out of business. Kresge, Jupiter and Kmart stores mainly competed with other store chains like Zayre, Ames, Bradlees, Caldor, Hills, and those that were operated by MMG-McCrory Stores (McCrory, McLellan, H.L. Green, J.J. Newberry, S.H. Kress, TG&Y, Silver's and eventually G.C. Murphy Co.). In 1977, S.S. Kresge Company changed its name to K Mart Corporation. In 1980, Vice Chairman Bernard M. Fauber was elected as the Chairman and as the CEO of Kmart. In 1981, the 2,000th Kmart store opened. By the end of 1981, there were 2,055 Kmart stores across the United States, Canada, and Puerto Rico. In 1987, the Kmart Corporation sold its remaining 76 Kresge and Jupiter stores in the United States to McCrory Stores, and the brands were almost entirely discontinued, although Canadian Kresge and Jupiter stores continued to operate until 1994. Until November 1990, when it was passed by Walmart, Kmart was the second-largest retailer in the United States, after Sears. During the 1980s, the company's fortunes began to change; many of Kmart's stores were considered to be outdated and in decaying condition. In the late 1980s and into the 1990s, the corporate office shifted much of its focus from the Kmart stores to other companies it had acquired or created, such as Sports Authority, Builders Square, and Waldenbooks. The original Blue Light Special[further explanation needed], first introduced in 1965, was retired in 1991. The company brought back the Blue Light Special in 2001, but again discontinued it in 2002. The concept was briefly revived in 2005, though Kmart at that time had no plans to use the concept long-term. Blue Light Specials were revived again in 2009 on Saturdays, offering surprise hour-long sales on selected merchandise, but were discontinued again. Blue Light Specials were revived once again in November 2015. In 1990, in an effort to update its image, Kmart introduced a new logo. It dropped the old-style italic "K" with a turquoise "mart" in favor of a red block letter K with the word "mart" written in script and contained inside the "K". Kmart then began remodeling stores shortly thereafter. This logo was replaced in 2004 with the current logo. In 1990, Little Caesars Pizza Station opened its first in-store Kmart restaurant in Rochester, Michigan. Coincidentally, both Little Caesars and Kmart were founded in Garden City, Michigan, in 1959 and 1962 respectively. In 1995, Kmart also tried to reinvent itself by using the short-lived name Today's Kmart. In 1991, the company changes its pronunciation to Kmart Corporation. In 1992, Kmart entered the Eastern European market with the purchase of 13 stores in the former Czechoslovakia. These stores were sold off in 1996. The company also began to offer exclusive merchandise by Martha Stewart, Kathy Ireland, Jaclyn Smith, Lauren Hutton, and Thalía. Other recognizable brands included exclusively licensed merchandising of products relating to Sesame Street and Disney. Actress and television personality Rosie O'Donnell and actor/director and producer Penny Marshall became among the company's most recognized spokespersons. 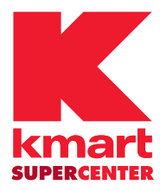 The Super Kmart Center logo that was used primarily in the early 1990s, but was also used for some stores that opened in 2001. This logo was also used on the former Super Kmart Center stores in Mexico during the 1990s. Super Kmart Center (Super Kmart) opened an all-new location on July 25, 1991 in Medina, Ohio, featuring a full-service grocery and general merchandise. However, this location was downsized in 2011 and was one of a number of Kmarts closed in early 2012 due to dismal Christmas 2011 sales. The second ground-up Super Kmart Center opened in Montrose, Ohio, featuring an in-store video rental center, and an in-store carryout Chinese restaurant. This location has also closed. The last Super Kmart Center in Warren, Ohio, closed on April 8, 2018. Big Kmart logo. Although discontinued, it remains one of the most common logos on Kmart stores. Big Kmart opened in Chicago, Illinois, on April 23, 1997. The format focuses on home fashions, children's apparel, and consumables (The Pantry). Most Kmart stores were remodeled to this format during the late 1990s and the early 2000s. During 1997 and 1998, Kmart converted 1,245 of their regular Kmart stores into Big Kmart stores. Initially, the Big Kmart stores were successful, and by the end of 1997, Kmart had seen their sales numbers grow by 10% due to success of their Big Kmart stores. In 1998, Kmart acquired 45 former Venture stores and converted them into Big Kmart stores. By the end of 1998, 62% of Kmart's stores were Big Kmart stores. Kmart later converted nearly 1,900 of their regular Kmart stores into Big Kmart stores in 1999. By the end of 1999, Kmart saw another increase in sales numbers by 6.5% due to the success of their Big Kmart stores. The Sports Authority was acquired by Kmart in 1990 and spun-off 5 years later. Kmart's profitability and sales peaked in 1992, and have since declined due to competition with Walmart, Target, and internet shopping. In 1994, Kmart closed 110 stores. Unlike its competitors Walmart and Target, Kmart failed to invest in computer technology to manage its supply chain. Furthermore, Kmart maintained a high dividend, which reduced the amount of money that was available for improving its stores. Many business analysts also faulted the company for failing to create a coherent brand image. In September 1995, Kmart sold its money-losing in-store auto repair centers to Penske Corporation for $112 million to operate them as Penske Auto Centers. Penske later closed the auto repair centers in 2002 as a result of a payment dispute with Kmart. In 1997, Kmart launched the Kmart Cash Card as a replacement for the paper gift certificates and facilitate the return process. In July 1999, Kmart hired SuperValu and Fleming to distribute $3.9 billion worth of food and other related products to all Kmart stores. From 1999 to 2000, Kmart opened 20 new Big Kmart stores, converted 12 regular Kmart stores into Super Kmart Center stores, and opened 5 new Super Kmart Center stores. Kmart also converted 150 regular Kmart stores into Big Kmart stores during the first half of 2000. In 2000, Kmart and Capital One launched an all-new co-branded MasterCard as a replacement for the private label Kmart credit cards. Also in 2000, Kmart expanded the Martha Stewart Everyday Garden Collection to include live plants and seeds. Kmart also launched the Martha Stewart Everyday Kitchen, which is a complete line of housewares essentials. In July 2000, Kmart closed 72 underperforming stores due to poor sales, and the company announced a planned major restructuring, in which Kmart would invest in new customer check-out and new inventory management technology and other related systems as well. In 2001, Kmart opened several new Kmart Super Center stores as part of Kmart's plan to expand their Kmart Super Center store portfolio, along with Kmart trying to make groceries available at stores as well. However, due to Kmart filing for bankruptcy in January 2002, Kmart was unable to open any more new Kmart Super Center stores, and any of the Kmart Super Center stores that were under construction during Kmart's 2002 bankruptcy were halted, no matter how close the stores were to completion. In 2001, Kmart signed a $4.5 billion arrangement with Fleming, making them the sole food and consumables distributor for the company's stores. In February 2001, Japanese video game company Sega sued Kmart for failure to pay $2.2 million of $25.9 million for Sega Dreamcast game systems. In August 2001, Target sued Kmart because the company's "Dare to Compare" advertising campaign inaccurately compared its own prices with those of Target a majority of the time on in-store signs. Kmart's lime green logo that was used only at five prototype locations in 2002. On January 22, 2002, Kmart filed for Chapter 11 Bankruptcy protection under the leadership of its then-chairman Charles Conaway and president Mark Schwartz. Conaway, who successfully expanded CVS Corporation, accepted an offer to take the helm at Kmart along with a loan of $5 million (equivalent to $6.96 million in 2019). In a scandal similar to that involving Enron, Conaway and Schwartz were accused of misleading shareholders and other company officials about the company's financial crisis while making millions and allegedly spending the company's money on airplanes, houses, boats and other luxuries. At a conference for Kmart employees on January 22, Conaway accepted "full blame" for the financial disaster. As Kmart emerged from bankruptcy, Conaway was forced to step down, and was asked to pay back all the loans he had taken. After dismissing Conaway and Schwartz, Kmart closed more than 300 stores in the U.S., including all the Kmart stores in Alaska, and laid off around 34,000 workers as part of the restructuring process. Kmart introduced five prototype stores with a new logo, layout, and lime green and gray color scheme, one in White Lake, Michigan, and four in central Illinois: (Peoria, Pekin, Morton and Washington). The new layout was touted as having wider aisles and improved selection and lighting, and the city or town's name was featured under the new Kmart logo at the front entrance. However, Kmart could not afford a full-scale rollout. The lime green prototype was abandoned for the new Kmart "Orange" concept that rolled out at several of its locations throughout the United States in 2006. While Kmart was going through bankruptcy, a significant amount of Kmart's outstanding debt was purchased by ESL Investments, a hedge fund controlled by Edward Lampert. Lampert worked to accelerate the bankruptcy process. On January 13, 2003, Kmart closed 326 stores due to a lack of profitability and poor sales. On May 6, 2003, Kmart emerged from bankruptcy protection as a subsidiary of the new Kmart Holding Corporation. On June 10, 2003, Kmart began trading on the NASDAQ stock market with the ticker symbol of KMRT with Lampert serving as the chairman and with ESL Investments controlling 53% of the new company for an investment of less than $1 billion. Lampert dismissed his concerns that the smaller company would be at a disadvantage, stating "The focus that a lot of people have in retail revolves around sales, but sales without profit do not allow a business to be successful in the long term." He began to improve the company's balance sheet by reducing inventory, cutting costs, and closing underperforming stores. By the fourth quarter of 2003, Kmart posted its first profitable quarter in three years, although it has since returned to an operating loss. On August 12, 2004, Kmart and E! Entertainment Television announced a new, exclusive, cross-promotional clothing brand called Attention. Attention was launched as a new clothing brand that would be sold only at Kmart stores and would be used to promote E! News Live. Kmart had previously signed a similar deal with the WB Network to have the cast of five WB shows wear Kmart branded clothing during shows. On November 8, 2004, Kmart launched the Kmart Rewards credit card that is managed by HSBC Bank. On November 17, 2004, Kmart's management announced its intention to purchase Sears for $11 billion. As part of the merger, the Kmart Holding Corporation (the company that owns Kmart) would be transferred to the new Sears Holdings Corporation and Sears would be purchased by the new Sears Holdings Corporation. The new corporation announced that it would continue to operate stores under both the Sears and Kmart brands. Around this time, Kmart changed its logo from a red K with the script "mart" inside, to the same K with the chain's name in lowercase letters below it. Kmart's headquarters were relocated to Hoffman Estates, Illinois, and in 2012 the sprawling headquarters complex in Troy, Michigan, was acquired by the Forbes Company, which owns the nearby upscale mall, Somerset Collection. No concrete plans for redevelopment of the site had been announced. In 2005, Sears Holdings Corporation introduced the Sears Essentials store format, which was supposed be like a Sears store and a Kmart store mixed together. Sears Essentials stores were freestanding (not located at a shopping mall) stores. In 2006, the company discontinued the Sears Essentials name, and renamed all of the Sears Essentials stores as Sears Grand stores. Kmart started remodeling stores to the "Orange" prototype in 2005. In 2006, the typical white and blue interior of the stores was changed to orange and brown, and shelf heights were lowered to create better sightlines. The remodeled stores contain an appliance department with Kenmore Appliances and most have hardware departments that sell Craftsman tools, which prior to the merger had been exclusive to Sears stores. Some auto centers left vacant by Penske after Kmart filed for bankruptcy had been converted to Sears Auto Centers. As of 2009, 280 stores had been remodeled to this new prototype. In July 2009, Sears Holdings opened its first Sears-branded appliance store inside a Kmart. The 4,000 sq ft (370 m2) store-within-a-store opened inside the former garden department of a Birmingham, Alabama, Kmart. It is two-thirds the size of the appliance department in most Sears stores, but larger than the 2,500 sq ft (230 m2) appliance department in remodeled Kmart stores. In October 2009, it was reported that Kmart and Martha Stewart Living Omnimedia failed to come to a new agreement. This came after Stewart made remarks on CNBC that her line at Kmart had deteriorated, particularly after the Sears merger. In November 2009, Kmart reported its first year-over-year sales increase of 0.5% since 2005, and only the second such increase since 2001. In 2010, Kmart closed 22 underperforming stores due to poor sales and a large decrease in profitability. During the first quarter of 2011, Kmart closed 35 more stores due to low profitability and poor sales. On December 27, 2011, after a disastrous holiday sales season, Sears Holdings announced that 100 to 120 of Sears and Kmart stores would close. In 2014, news reports indicated that Kmart was liquidating dozens of stores across the United States. Kmart's parent company, Sears Holdings Corporation, underwent financial distress throughout the year, sparking an unspecified number of closings of Sears and Kmart locations amid vendors' and lenders' concerns about its liquidity. Along with store closings, measures included the spinning off its Lands' End division, selling most of its stake in Sears Canada, issuing debt and taking on loans that cumulatively put it on track to raise $1.445 billion in cash in 2014. Howard Riefs, a company spokesman who has often spoken on behalf of Kmart, said, "Store closures are part of a series of actions we're taking to reduce on-going expenses, adjust our asset base and accelerate the transformation of our business model." On October 10, 2014, Kmart was a victim of a data breach concerning customers' credit and debit card information. On October 19, Kmart stated, "Based on the forensic investigation to date, no personal information, no debit card PIN numbers, no email addresses and no social security numbers were obtained by those criminally responsible. There is also no evidence that kmart.com customers were impacted. This data breach has been contained and the malware has been removed. I sincerely apologize for any inconvenience this may cause our members and customers." In January 2015, Kmart agreed to pay $102,048 and other consideration to settle a U.S. Equal Employment Opportunity Commission disability discrimination lawsuit. According to the lawsuit, Kmart offered a job at its Hyattsville, Maryland, store to a candidate with kidney disease on dialysis. The candidate advised the hiring manager that he could not provide a urine sample for the company's mandatory pre-employment drug screening because of his medical condition, and requested a reasonable accommodation such as a blood test or other drug test that did not require a urine sample; Kmart had refused to provide an alternative test and denied the candidate employment. In April 2016, Kmart announced that it was liquidating 68 stores. The chain announced in September 2016 that 64 more stores in 28 states would close by mid-December 2016. In December 2016, at least 25 Kmart locations were targeted for closure in early 2017. In January 2017, Kmart announced that 78 more stores would close, including the first Kmart location in Garden City, Michigan. In May 2017, Kmart announced the upcoming closure of 18 more stores. Sears Holdings admitted uncertainty regarding the survival of both Sears and Kmart. In early June 2017, Kmart announced that an additional 49 stores across the U.S. were to be shuttered by September 2017. Financial analysts are now warning that the fate of Sears Holdings is nearing its end. However, Sears Holdings CEO Eddie Lampert stated in October 2016 that there were not and never had been plans to close the Kmart format and that they are working hard to make it a "more fun, engaging place to shop, powered by our integrated retail innovations and Shop Your Way". In early July 2017, Kmart had announced that 35 more stores would close by early October 2017. In late August 2017, Kmart announced another 28 store closures, including the last Rhode Island location, in Cranston. On October 11, 2017, with no closing sale held, the Kmart store in Santa Rosa, California, was apparently burnt down by wildfires in the Bay Area, adding to the list of closed stores. On October 17, 2017, Kmart announced the liquidation of an unspecified number of locations by late November. On November 3, 2017, it was announced that a further 45 Kmarts (along with 18 Sears stores) were to close, effective by January 2018, including Kmart's last store in Alabama, in Albertville. A smaller Big Kmart located in Greenwich, New York in 2017. This store closed in March 2019 along with 79 other Kmart and Sears stores. According to Fortune.com, Kmart and Sears did not run any television advertisements during the 2017 holiday season to focus on digital marketing and after evaluating the effectiveness of its various marketing efforts. On January 4, 2018, after yet another disappointing holiday sales season, Kmart announced the liquidation of 64 more stores in the spring of 2018. This includes Kmart's only remaining Super Kmart location in Warren, Ohio, officially discontinuing the Super Kmart format. According to MSN Money, at this rate, Kmart, along with sister company Sears, has an extremely high chance of disappearing and going defunct in 2018, and that 2017 will have marked its final holiday season as an independent brand. On March 15, 2018, Sears Holdings announced that a small profit was made in the fourth quarter of 2017. However, investors are claiming that it is due to tax refunds and that sales are still falling for both Kmart and Sears. On March 26, 2018, CEO Eddie Lampert said, "I'm not sure Kmart on its own could ever be a great retailer," implying that the company is trying to shift to online shopping as opposed to brick and mortar stores. On April 12, 2018, Sears announced plans to close and auction 16 of its Sears stores, and close several more Kmart locations, but did not specify how many. Two known locations on the list are Kmart stores in Brandon, Florida, and Saugus, Massachusetts. In early May, Sears announced the liquidation of several more Kmarts, including the last Kmart in Vermont, in Bennington. Kmart store closing sale in Gillette, Wyoming in 2018. On May 21, 2018, Sears Holdings announced yet another round of liquidation sales in forty Sears and Kmart stores across 24 states. These stores were closed by July 4, 2018. On May 31, Sears Holdings announced the liquidation of an additional 16 Kmart stores and 48 Sears stores, including the last Kmart in Hawaii, in Lihue. The May 31, 2018, closings announced were from among 100 nonprofitable stores in Sears Holdings and the remaining 28 nonprofitable stores are, "a small group of stores that was pulled from the closing list ... as they are being evaluated further," meaning even more store closings could occur later in the year. Sears Holdings did not yet disclose these locations. On June 28, 2018, Sears Holdings disclosed 10 of the stores being evaluated and announced they would close by September 2018. Liquidation sales began on the same day. On July 13, 2018, news came through from multiple sources that even more Kmart stores have been set to liquidate across the nation. On August 23, 2018, Sears Holdings announced 13 more Kmart stores would close by November of the year. On October 15, 2018, Sears Holdings filed Chapter 11 bankruptcy and will close 142 stores, including 63 Kmart stores, which includes the last Kmart in Arkansas, in Russellville, the last two Kmarts in Georgia, in Covington and Peachtree City, and the last two Kmarts in Kansas, in Kansas City and Salina. Sears Holdings' bankruptcy also marked Kmart's second bankruptcy in 16 years. On November 8, 2018, Sears Holdings announced it would close an additional 40 stores, including 11 Kmart stores. On November 23, 2018, Sears Holdings released a list of 505 stores, including 239 Kmart stores, that are for sale in the bankruptcy process while all others are currently holding liquidation sales. However, the stores for sale are not guaranteed to be protected from liquidation in the future. On December 28, 2018, Sears Holdings announced it would close 80 additional stores, including 37 Kmart stores, which includes the only remaining Kmart in Missouri, in Crystal City, the only remaining Kmart in South Dakota, in Rapid City, the only remaining Kmart in Nebraska, in Alliance, the only remaining Kmart in Louisiana, in Metairie, and the only remaining Kmart in Mississippi, in Gulfport, which will now leave Kmart absent in 13 states. In a proposal announced in early January, Sears Holdings plans only to keep 202 Kmart stores along with 223 Sears stores open, assuming that it survives the bankruptcy process. Most of the proposed locations are in highly populated coastal regions. On January 15, 2019, when it had appeared that Kmart's parent, Sears Holdings, was preparing to file for Chapter 7 liquidation, the bankruptcy court judge ordered the company to return to negotiation table and work out a new deal with Eddie Lampert to prevent the liquidation from occurring. A new deal was struck at the last minute that would keep up to 400 Sears and Kmart stores operating. On January 19, 2019, Sears Holdings officially announced that they had won the auction, and that some of the then existing stores were to remain open. On January 24, 2019, a group of unsecured creditors, which included Simon Property Group, filed a motion with the bankruptcy court to overturn the deal Sears Holdings had recently made with Lampert claiming that Lampert had been "engaged in serial asset stripping" of the company at the expense of suppliers and landlords. The creditors vowed the bankruptcy court to force the company into liquidation instead. On January 28, the federal government-operated Pension Benefit Guaranty Corporation announced that they were not in favor of the current Sears Holding agreement with Lampert since that agreement would create a $1.7 billion funding gap in the employee pension fund that would require the American tax-payers to cover the shortfall. In February 2019, it was announced that a U.S. bankruptcy judge approved the sale of Sears Holdings in favor of Edward Lampert; therefore, the company that operates both Sears and Kmart has avoided further bankruptcy consequences. However, Sears Holdings announced major plans to remaster and improve the company as a whole. Kmart will have 202 locations after the sale is completed. The owner of Kmart, Transform Holdco LLC, has had its headquarters in Hoffman Estates, Illinois just outside of Chicago since 1993 when it moved out of the Sears Tower in downtown Chicago. Kmart's headquarters have been in Hoffman Estates since Kmart bought Sears in 2005. The headquarters were formerly located in the Kmart International Headquarters at 3100 W. Big Beaver Road in Troy, Michigan in Metro Detroit. The facility had 23 interconnected modules. Each had three stories, except for one module, which was one story. Based on the layout, Norm Sinclair of DBusiness concluded that it was "a study in inefficiency". Big Kmart store in Carlisle, Pennsylvania, December 2012. It was later converted into a regular Kmart with the current logo. This store closed in December 2018, along with 141 other Kmart and Sears stores. Kmart is a chain of discount department stores that are usually free-standing or located in strip malls. They carry compact discs (CDs), DVDs, TV shows on DVD, electronics, bedding, household hardware, sporting goods, clothing, toys, jewelry, office supplies, health and beauty products, over-the-counter medications, home decor, and a limited selection of food items. Many also have a garden center, a Jackson Hewitt tax center, a pharmacy, and a K-Cafe or a deli serving Nathan's Hot Dogs and pizza. Kmart stores range from 80,000–110,000 sq ft (7,400–10,200 m2). Most of them were either converted to or rebranded as Big Kmart while some were converted into Super Kmart stores. A Little Caesars in a Kmart in Hollywood, Florida in August 2013. While the entire store is still open as of 2019, this Little Caesars location has since been closed. A Super Kmart Center store in Lorain, Ohio in February 2013. This store has closed as of September 18, 2016. A Super Kmart Center store with Super Kmart signage in Southgate, Michigan in July 2014. As indicated on the banner, this store began a liquidation sale one month earlier and closed on October 12, 2014. Big Kmart is a chain of discount department stores that carried everything a regular Kmart carries, but emphasizes home decor, children's clothing, and more food items such as meat and poultry, baked goods, frozen foods and an extended, but limited section of garden produce. Big Kmart stores ranged from 84,000–120,000 sq ft (7,800–11,100 m2). 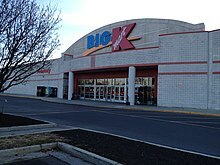 Big Kmart stores also featured a garden center, a pharmacy, a branch of a local bank, a Jackson Hewitt tax center, an Olan Mills portrait studio, an arcade, a K-Café or Little Caesars Pizza Station, and sometimes a Kmart Express gas station. 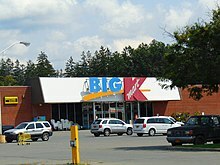 As noted above, Kmart introduced the Big Kmart brand company-wide when it was introduced in 1997. Some Big Kmart locations were either closed or converted to normal Kmart stores. Although the logo still stands on many Kmart locations today, the Big Kmart format was discontinued during Kmarts decline era from 2010-2018. A Kmart location in Redwood City, California in August 2016. This store is still open as of 2019. A Kmart Express gas station in Cleveland, Ohio in February 2013. The store near it, as well as this Kmart Express, closed a few months later. American Fare was a chain of hypermarkets that operated from 1989 to 1994. It was a joint venture involving Kmart, which owned 51 percent of the store, and Birmingham, Alabama-based Bruno's Supermarkets, which owned 49 percent of the stores. The first store opened in Stone Mountain, Georgia, near Atlanta, on January 29, 1989. American Fare's 244,000 sq ft (22,700 m2) of retail space included 74,550 sq ft (6,926 m2) of groceries, 104,000 sq ft (9,700 m2) of general merchandise, and 35,000 sq ft (3,300 m2) of clothing (including apparel, footwear, and accessories). An area in the front of the store housed a music and video store, a food court, bank, hair salon, pharmacy and a card store. Charlotte, North Carolina, was home to the second American Fare, which opened on April 1, 1990 with 160,000 sq ft (15,000 m2) of retail space. A third and final store opened in Jackson, Mississippi in August 1990, with plans for a fourth store in Birmingham, Alabama never coming to fruition. In June 1992, Bruno's announced the termination of its partnership with the Kmart Corporation, and that Kmart would assume ownership of the three stores. The three stores closed by May 1994.The Stone Mountain store now houses the DeKalb County Board of Education. The Charlotte, NC store was converted to Super Kmart, then a Steve & Barry's, before closing in 2009 It now houses a Verizon call center, and the Jackson store's parking lot became a Carmax in 2007, while the building itself is now owned by Comcast. The American Fare brand is used on some Kmart store brand consumable products. BlueLight internet service. In 1999 Kmart began offering a dial-up internet service called BlueLight, which was eventually spun off as an independent company. BlueLight was initially free and supported by banner ads. BlueLight dropped the free service in February 2001 and was reacquired by Kmart in July 2001. In 2002 United Online, which also owns NetZero and Juno, bought the BlueLight service after Kmart filed for bankruptcy. In August 2006, Bluelight dropped the banners. In August 2006, the service cost $14.95 a month and had around 165,000 subscribers. Borders Books was a chain of bookstores acquired by Kmart in 1992. In 1994, Borders merged with the Kmart chain Waldenbooks to form Borders-Walden Group, which was sold in 1995. In February 2011, Borders filed for Chapter 11 bankruptcy and announced plans to liquidate in July after failing to find a buyer to keep the chain's remaining 399 stores in operation. The remaining stores closed in September. Builders Square was a home improvement superstore. In 1997, it was sold to Hechinger, which went out of business in 1999. Designer Depot: A discount clothing store chain operated in Metro Detroit in the 1980s. The first opened in a former S. S. Kresge dime store in St. Clair Shores, Michigan in 1982, selling brand names such as Yves Saint Laurent, Izod, and Calvin Klein at discount prices. K-Café was an in-store restaurant that served a fairly standard menu of hamburgers, hot dogs, French fries, grilled cheese sandwiches and Philly cheesesteak. They also offered a full breakfast menu of baked goods, bagels and egg platters with bacon or sausage and such snacks as nachos, pretzels, popcorn and ice cream. In addition to the café's menu, hot food items could also be purchased at the deli and eaten in the Deli Cafe at Super Kmart Center stores. However, K-Café has been discontinued in almost all of their stores.[when?] Most restaurants that were located at Super Kmart Center stores were instead known as Super K-Café. However, some Kmart stores have Nathan's Famous Hot Dog Eateries and Little Caesars Pizza Stations instead of K-Cafes, like a Kmart store in Guam. KDollar was a chain of discount stores/dollar stores that sold Kmart merchandise at a discount. The stores are often former Kmart or Big Kmart stores that have been converted to the KDollar concept. Sears Brands filed for a trademark on the KDollar name on November 6, 2012. The first opened in a former regular Kmart store in Bloomfield Hills, Michigan in 2013. A second KDollar store opened in Waukegan, Illinois. Kmart Chef restaurants were a small chain of free-standing fast-food restaurants owned by Kmart, started in 1967 with the first location on the parking lot of a Kmart in Pontiac, Michigan. The "limited, high-turnover menu" (as Kmart founder S.S. Kresge put it) consisted of hamburgers, French fries, hot dogs, and soft drinks. The Kmart Chef chain folded in 1974 after peaking at eleven locations. Kmart Dental was an in-store dental office that was located in Kmart stores. There was only one such prototype in a Kmart store, located in Miami, Florida. Despite the name, Kmart Dental was never technically owned by Kmart. Kmart Express was a chain of gas stations/convenience stores located in out-parcels at some Kmart and Super Kmart stores, particularly in the Midwest. In the early 2000s there were plans to expand this concept to most Kmarts, but the plan for more locations was canceled after Kmart's bankruptcy in 2002. Kmart Food Stores was a supermarket chain founded in 1962. Most Kmart Food locations were paired with Kmart stores, often operated by a local grocery chain but always branded as Kmart Food. The chain was discontinued in the early 1980s. Kwash was an attached-to-store laundromat launched in May 2010. Only one such prototype existed. It was in a former auto bay in Iowa City, Iowa. It featured a separate entrance, laundromat attendants and free wi-fi along with a limited selection of laundry goods available for purchase. The Kwash closed along with the Kmart in 2017. Makro, a Dutch warehouse club chain, operated locations in the U.S. from February 1981 to 1989, in Atlanta, Philadelphia, and the Washington, D.C. suburb of Largo, Maryland. Kmart bought the chain's entire American holdings in 1989, having owned a 49 percent share before. The Makro stores were later converted to Pace or closed in 1990. Office Square was a chain selling office supplies and office furniture which was a spin-off of Builders Square. In 1991, OfficeMax was acquired by Kmart and Office Square was merged into OfficeMax stores. OfficeMax is a chain selling office supplies and office furniture which was acquired in 1991 and sold in 1995. It was acquired by Office Depot in 2013. Pace Membership Warehouse was Kmart's warehouse club brand, until the chain was purchased by Walmart. In 1993, Walmart converted most of the stores into its Sam's Club brand, and sold others to chains such as Bradlees. PayLess Drugs was a chain of drug stores acquired by Kmart in 1985 and later sold to TCH Corporation in 1994. The resulting entity, Thrifty PayLess, was acquired by Rite Aid in 1996, which converted all of the PayLess and Thrifty stores into Rite Aid stores in 1999. The PayLess division also owned Bi-Mart, which was spun off along with sister stores such as Pay 'n Save. The Sports Authority was a chain of sporting goods stores which was acquired in 1990 and sold in 1995. Sports Authority went out of business in 2016. Super Kmart Center was a chain of superstores that carried everything a regular Kmart carries, but also had a full grocery section with meat and poultry, baked goods, a delicatessen, garden produce, and fresh seafood. Kmart Super Centers ranged from 140,000 to 190,000 sq ft (13,000 to 18,000 m2). The first store opened in Medina, Ohio, on July 25, 1991. A few stores that were built in the late 1990s were known instead as Super Kmart. Super Kmart Center stores also featured a garden center, a video rental store, a branch of a local bank, an arcade, a portrait studio, a Jackson Hewitt tax center, a pharmacy, and usually a deli cafe or Little Caesars Pizza Station. Many of these services were closed and discontinued in recent years. Several locations also included Kmart Express gas stations, and most had an auto center. Most Kmart Super Centers were closed during the two rounds of closures in 2002 and 2003, and many had their groceries taken out, converting them into regular Kmart locations. A typical Super Center sold around $30 million of merchandise during one fiscal year. In 2015, some stores were converted into a regular Kmart with a concept called K-Fresh. These stores feature an expanded pantry and a fresh food department, though these types of items are no longer prepared on-site and instead are prepackaged. The deli, butcher and bakery operations were also closed. Kmart gradually closed its Super Kmart stores; the last location was in Warren, Ohio and closed on April 8, 2018. It is scheduled to be replaced by Kmart competitor Meijer. U-Pak was a single "no frills" supermarket which sold items out of boxes instead of on shelves, and featured reduced hours. It opened adjacent to a Kmart on Opdyke Boulevard in Pontiac, Michigan in 1979 and closed less than a month later due to poor sales. Variety Outlet. A closeout chain, typically operated out of closed Kmart stores. The first opened in Rome, Georgia in 1994. Kmart for Kids is the umbrella program for Kmart's philanthropic initiatives. The program helps children across the country live happier, healthier lives through the support of: March of Dimes, St. Jude Children's Research Hospital, and American Diabetes Association. Kmart is March of Dimes' number 1 corporate sponsor, having raised $114 million for the charity over more than 30 years. On July 29, 2008, Don Germano, SVP/GM of Kmart stores, was elected to a five-year term on the national Board of Trustees of the March of Dimes Foundation. Kmart for Kids supports St. Jude's Children's Research Hospital through its annual Thanks and Giving campaign, an opportunity for Kmart customers to give thanks for the healthy children in their lives and give to help those who are not. Kmart has been a partner of the campaign since 2006, and as of December 2008[update], had raised more than $59.2 million (equivalent to $68.9 million in 2019) for St. Jude's. A record $21.9 million (equivalent to $23.6 million in 2019) was donated for the tenth annual fundraising campaign during the 2013 holiday season. In 2008, Kmart earned the "Outstanding Corporate Citizen" Award for its support of the American Diabetes Association's "Step Out: Walk to Fight Diabetes" program. The tribute honors Kmart for the most well-developed, proactive program in the areas of charity, community development, diversity, philanthropy, and associate development. In 2008 Kmart became a national sponsor of "Step Out: Walk to Fight Diabetes" and over the past two years, Kmart's customers and associates have raised approximately $1.5 million (equivalent to $1.86 million in 2019) through its in-store campaigns. On May 9, 2007, Kmart was penalized $102,422 (equivalent to $124 thousand in 2019) for violations of federal hazardous waste, clean water, emergency planning and preparation regulations at 17 distribution centers. Kmart corrected the violations by preparing and implementing spill-prevention control and countermeasure plans, applying for appropriate storm-water permits, complying with hazardous-waste-generator requirements, and submitting reports to state and local emergency-planning and response organizations informing them of the presence of hazardous substances. The Environmental Protection Agency also accused Kmart of not maintaining adequate information and failing to act in accordance with hazardous-waste-storage and disposal requirements. For instance, the EPA reported having discovered improperly labeled oil-storage drums at a location in Falls, Pennsylvania. Out of concern for the environment, Kmart promoted battery recycling. In 1990, Kmart even proposed spending about $80 million (equivalent to $153 million in 2019) on full-page newspaper advertisements offering to recycle junk batteries for $2 (equivalent to $4.00 in 2019) each. In 2012, Kmart and Sears began to allow customers who are members of their Shop Your Way Rewards program to receive receipts by e-mail, eliminating paper waste and cutting down on the usage of ink. In 2012, Mercy for Animals, a non-profit organization working against cruelty to farmed animals, conducted an infiltration at Christensen Farms, a pork supplier to Kmart, Walmart and Costco, obtaining hidden-camera footage of pigs confined in small gestation crates and cruelty to piglets. In response to Mercy For Animals' infiltration, Kmart announced it would begin requiring its pork suppliers to phase out gestation crates. Kmart was a prominent sponsor in NASCAR and the now-defunct CART series. They were a longtime sponsor of Newman/Haas Racing, owned by actor Paul Newman and former racer Carl Haas. Their CART drivers included Nigel Mansell and the father-son duo of Michael and Mario Andretti. Michael Andretti and Mansell won championships under Kmart sponsorship in 1991 and 1993, respectively. The store also sponsored the NASCAR-sanctioned Kmart 400 at Michigan and North Carolina Speedway. Lake Speed garnered Kmart's first win in NASCAR in 1988 at the Darlington Raceway. Kmart sponsored three-time champion Darrell Waltrip in 1999 and 2000, his last two full-time seasons. Most recently, in NASCAR, the store sponsored Boris Said's #60 No Fear Ford Fusion in 2006. The first Kmart in Australia opened in 1969 in Burwood East, Victoria; the site was renovated in 2010 to be a shopping mall known as Burwood One. Kmart Australia was born out of a joint venture between G.J. Coles & Coy Limited (Coles) and S.S. Kresge Company, with Kresge owning 51% of the common stock in the company. The first New Zealand store opened in Henderson in 1988. Kresge later exited this partnership. Since 2007, the Australian and NZ Kmart stores are owned by Wesfarmers. Former Kmart Store in Bayers Lake, Nova Scotia shown in 1994. Canadian Tire now operates in its place. Kmart was once a major presence in Canada, with its first Kresge store opening in 1929. Kmart closed 5 Montreal stores and several other Quebec stores in 1983 due to the company restructuring. Kresge ceased to exist in Canada in 1994. In December 1997, it was announced that 10 of the existing 122 stores were to be closed. However, as a result of Kmart's ongoing financial difficulties, the Canadian division comprising 112 stores was sold to competitor Zellers of the Hudson's Bay Company in May 1998, after which the stores were either closed or converted to Hudson's Bay Company brands, mostly Zellers. In late 2000, Kmart quietly started a major expansion into the Caribbean countries where Wal-Mart and Target had no presence, but ultimately none of the proposed stores advance beyond the construction stage and were never opened by the time Kmart filed for bankruptcy in 2002 when it stopped paying its construction contractors. Kmart started construction of a Super Kmart in 2001 in Trinidad but halted in 2002 when the store was 80 percent complete. There were plans for more stores to be built in Trinidad, as well as in Millennium Heights in Barbados, five stores in the Dominican Republic, and a potential foray into Jamaica. The unfinished Super Kmart store in Trinidad and Tobago is now a Tru Value Supermarket, which is the largest supermarket. In 1992, Kmart purchased several communist-era department stores in Eastern Europe, including 13 in the former Czechoslovakia that were bought from the former Czechoslovak government. One of those stores was the old MÁJ department store on Národní Třída in Prague. Many of these outlets were quite profitable, with the Bratislava location setting a single-store sales record for the company. In March 1996, due to its troubles in the U.S., the Kmart Corporation announced that it had agreed to sell the six Kmart stores in the Czech Republic and the seven in Slovakia to Tesco PLC of Britain for about $117.5 million (equivalent to $188 million in 2019), to focus on its core operations in North America. In the 1990s, Kmart opened four stores in Mexico, in partnership with the Mexican retailer Liverpool. All were supercenters located in suburbs of Mexico City. About half of the store area was devoted to groceries, and this part of the stores resembled those in the US with some adjustments to the local market. These plus an unfinished store were sold in 1997 to the Mexican hypermarket chain Mega (part of Comercial Mexicana) and remain open under that name, except the store in Tlalnepantla, which was demolished in 2004 to build a Costco. In 1994, Kmart opened a 9,700-square-metre (104,000 sq ft) store in the Marina Square Shopping Center in a joint venture with Metro (Private) Limited. The joint venture with Singapore was dissolved in 1996. ^ "2015 Form 10-K, Sears Holding Company" (PDF). Sears Holdings. January 30, 2016. ^ a b "Kmart Corporation History". FundingUniverse. n.d.
^ a b "The first Kmart - includes related articles - 30 Years of K Mart - Cover Story". Discount Store News. February 17, 1992. Archived from the original on July 9, 2012 – via FindArticles. ^ "KMART CORP Annual Report - Fiscal Year Ending January 29th, 2000". U.S. Securities and Exchange Commission. January 29, 2000. Retrieved March 14, 2017. ^ "Sears ex-ceo closes deal to buy Sears and Kmart". USA TODAY. USA TODAY. January 11, 2019. ^ "S.S. Kresge". Reference for Business, Encyclopedia for Business, 2nd ed.. n.d. Retrieved December 22, 2009. ^ a b "Kresge Stores Observe Golden Anniversary". Dunkirk Evening Observer. May 9, 1949. p. 9. Retrieved July 10, 2017 – via Newspapers.com. ^ Barmash, Isadore (April 4, 1988). "A Kresge-McCrory Reunion". The New York Times. ^ a b Drew-Bear, Robert (1970). Mass Merchandising: Revolution & Evolution. New York: Fairchild. p. 215. OCLC 56099 – via Google Books. ^ a b "The K-Mart Corporation: How It Came to Be". Men's Wear. 176. p. 52 – via Google Books. ^ Farid-Es-Sultaneh v. Commissioner, 160 F.2d 812 (2d Cir. 1947). ^ Shiver, Jube, Jr. (April 4, 1987). "K mart Shedding 5-and-Dime Roots With Kresge Stores Sale". Los Angeles Times. ^ "Wendy's to get space in Kmart". Times Daily. August 18, 1985. p. 9C. Retrieved September 4, 2014 – via Google News. ^ Gala, Diane (August 8, 1985). "Kmart, Wendy's join forces under one roof" (PDF). Canton Observer. ^ Rosenberg, Joyce M. (December 7, 1990). "Retailers say 'tis true: Christmas sales are slow". The Free Lance-Star. p. 7 – via Google News. ^ "Company Briefs". New York Times. July 3, 1990. ^ "Agency's first Kmart ads". Ad Age. August 3, 1995. ^ "Rosie and Penny Divide and Conquer in New Big Kmart Ad Campaign". PR Newswire (Press release). October 1, 1998 – via The Free Library. ^ "Super K's new phase will be to develop a more complete store with a broader mix". Discount Store News. February 12, 1990. Archived from the original on March 28, 2005 – via FindArticles. ^ Miller, Pamela J. (January 6, 2012). "Kmart closing in Medina: More than 100 stores expected to shut their doors nationwide". Medina Post. Archived from the original on January 10, 2012. Retrieved May 27, 2012. ^ Frederick, James (November 9, 1992). "Kmart unveils biggest Super Center: food taking major role at discounter". Drug Store News. Archived from the original on July 8, 2012. Retrieved August 26, 2009 – via FindArticles. ^ a b "Kmart Stores". Sears Holdings Corporation. n.d. Archived from the original on March 31, 2009. Retrieved August 26, 2009. ^ Manion, Cristen (January 4, 2018). "Niles, Hermitage Kmart Stores to Close in April". WFMJ News. Retrieved January 5, 2018. ^ "Kmart Introduces Prototype for New Store Layout". New York Times. April 24, 1997. ^ Young, Vicki M. (May 4, 1998). "All 73 Venture Stores to Go Dark; Kmart Acquiring Most of Leases. Only one location in Crystal City, Missouri remains from these". Home Furnishing Network – via The Free Library. ^ "K Mart Closing Stores: 4 In Illinois; 110 In All; 7,650 Jobs". Chicago Tribune. September 8, 1994. ^ "Kmart Sells Money-Losing Auto Service Business : Divestiture: Roger Penske buys 860 centers for $112 million. Company to focus on retailing". Los Angeles Times. September 26, 1995. ^ Buck, Genevieve (September 26, 1995). "Kmart To Sell Automotive-service Chain: Discounter Steers Focus Back To Retail". Chicago Tribune. ^ "Penske Auto Centers close for good". United Press International. April 9, 2002. ^ Hays, Constance L. (April 9, 2002). "Kmart and Penske Told to End Dispute Over Closing of Auto Centers". New York Times. ^ "Kmart announces 'cash card' gift system". United Press International. August 5, 1997. ^ "Kmart signs grocery pact". CNN. July 21, 1999. ^ Bush, Michael (September 28, 2000). "Capital One, Kmart to Launch Co-Branded Credit Card". DMN. ^ Koncius, Jura (February 24, 2000). "Martha's Growing Empire". Washington Post. p. H01. ^ McCormack, Shaun (October 9, 2000). "Kmart Showcasing New Martha Stewart Line in Retail Stores". DMN. ^ "72 Kmarts To Close". CBS News. July 25, 2000. ^ Sliwa, Carol (July 31, 2000). "Kmart moves to catch up on IT: Big dollars to go for long-needed upgrades". Computerworld. ^ "Kmart Rolls Out 'Store Within A Store' Concept, SuperCenter Expansions and New Stores". Kmart (Press release). October 25, 2001. ^ "Fleming Becomes Kmart's Sole Food Supplier". New York Times. February 8, 2001. ^ Pham, Alex (February 23, 2001). "Sega Lawsuit Accuses Kmart of Failing to Pay". Los Angeles Times. ^ Goldman, Abigail (August 22, 2001). "Target Suing Kmart Over Its 'Dare to Compare' Ads: Marketing: Complaint claims the second-largest retailer's campaign uses inaccurate figures". Los Angeles Times. ^ Davies, Richard; James, Paul; Schindelheim, Ramona & Valenti, Catherine (January 22, 2002). "Kmart Files for Bankruptcy". ABC News. ^ "Kmart files Chapter 11". CNNMoney. January 22, 2002. ^ Schmid, Christine & Markell, Joanna (January 14, 2003). "Kmart closing all of its Alaska stores: Up to 35,000 jobs to be lost nationally". Juneau Empire. Associated Press. Archived from the original on October 21, 2015. Retrieved July 27, 2013. ^ "Deep in the red, Kmart abandons that color for its logo, picks green". Toledo Blade. October 16, 2002. ^ Hays, Constance L. (January 15, 2003). "Kmart Will Lay Off Up to 35,000 and Close 326 Stores". New York Times. ^ a b Hays, Constance L. (November 18, 2004). "Kmart Takeover of Sears Is Set; $11 Billion Deal". The New York Times. ISSN 0362-4331. Retrieved September 15, 2016. ^ Gilson, Stuart C. (2010). Creating Value Through Corporate Restructuring: Case Studies in Bankruptcies, Buyouts, and Breakups (2nd ed.). Hoboken, New Jersey: John Wiley & Sons. ISBN 978-0-470-50352-2 – via Google Books. ^ Hays, Constance L. (May 7, 2003). "A new start, a new name. But have things really changed as Kmart comes out of bankruptcy?". The New York Times. Retrieved February 16, 2012. ^ John Eggerton (August 12, 2004). "E! Shops at Kmart". Broadcasting & Cable. ^ Johnston, Lauren (May 20, 2004). "Kmart Lends Fashion To The Stars". CBS News. ^ Snavely, Brent (November 8, 2004). "Kmart starts loyalty credit-card program". Crains Detroit Business. ^ Bhatnagar, Parija (November 17, 2004). "The Kmart-Sears deal: Two of nation's oldest retailers set $11B merger. Will lower prices, better merchandise follow?". CNNMoney. Retrieved March 7, 2012. ^ Kaffer, Nancy (February 22, 2006). "Former Kmart Corp. headquarters in Troy sold to Somerset owner". Crain's Detroit Business. Crain Communications, Inc. Retrieved July 9, 2012. ^ Jones, Sandra (February 22, 2006). "Sears ditches Sears Essentials name". Crain's Chicago Business. Retrieved July 17, 2009. ^ "Kmart goes orange for redesign of stores". Crains Detroit Business. March 14, 2005. ^ Felgner, Brent (August 5, 2006). "Kmart: Spit 'n Shine ...and a Bit of Sears". Home & Textiles Today. Retrieved August 26, 2009. ^ Jones, Sandra & Hockensmith, Lisa (April 24, 2006). "Sears reopening some Kmart auto centers; Test drive expected to start in Detroit-area outlets". Tire Business. Retrieved August 26, 2009. ^ Wolf, Alan (August 3, 2009). "Sears Opens First In-Store Majap Shop Inside Kmart". Twice. Archived from the original on July 17, 2011. Retrieved August 26, 2009. ^ "Martha Stewart Fails to Reach New Kmart Deal". The New York Times. Bloomberg News. October 16, 2009. Retrieved October 21, 2009. ^ Hals, Tom (November 19, 2009). "Sears loss narrows as Kmart shows improvement". Reuters. Retrieved November 25, 2009. ^ "Sears to close 100 to 120 Kmart, Sears stores". CBS News. December 27, 2011. ^ Newman, Jeff (September 26, 2014). "Local Kmart closings part of Sears' ongoing woes". Indianapolis Business Journal. ^ a b Wahba, Phil (October 20, 2014). "As Sears shrinks, it takes on a new role: Landlord". Fortune. ^ Shaver, Pat (October 17, 2014). "Bloomington Kmart to close". Bloomington Pantagraph. ^ Berry, Lucy (October 20, 2014). "Kmart on Memorial Parkway in Huntsville will close by mid-January". The Birmingham News. ^ Perlroth, Nicole (October 10, 2014). "Kmart and Dairy Queen Report Data Breach". The New York Times. Retrieved October 19, 2014. ^ Lewis, Dave (October 14, 2014). "Sears Owned Kmart Discloses Data Breach". Forbes. Retrieved October 19, 2014. ^ "Kmart Will Pay $102,048 to Settle EEOC Disability Discrimination Lawsuit". U.S. Equal Employment Opportunity Commission. January 28, 2015. Retrieved March 9, 2015 – via The National Law Review. ^ Chew, Jonathan (April 22, 2016). "Here's a List of All the Sears and Kmart Stores That Are Closing". Fortune. ^ Peterson, Hayley (September 19, 2016). "Kmart is closing 64 more stores and laying off thousands of employees – see if your store is on the list". Danbury News-Times. ^ White, William (December 29, 2016). "24 Kmart Stores Closing in 2017: See the List". InvestorPlace. ^ Sambides, Nick (December 29, 2016). "'Unprofitable' Bangor Kmart to close in April". Bangor Daily News. ^ Millitzer, Joe (January 4, 2017). "Full list of Kmart and Sears stores closing across the country". KTVI. ^ Burkham, Larry. "Kmart stores in Dubuque, Waterloo among those closing by end of March". KCRG-TV. Retrieved January 5, 2017. ^ Jones, Charisse (June 20, 2017). "Sears quietly closing 30 more stores". MSNBC. Archived from the original on May 20, 2017. Retrieved May 21, 2017. ^ Isidore, Chris (March 23, 2017). "Sears has 'substantial doubt' that it can survive". CNN. ^ 72 more Sears and Kmart stores are closing — see if yours is on the list. MSNBC. June 7, 2017. ^ Peterson, Hayley (January 8, 2017). "Inside Sears' death spiral: How an iconic American brand has been driven to the edge of bankruptcy". Business Insider. ^ Heller, Laura (October 3, 2016). "Sears' Eddie Lampert Says Kmart Isn't Closing". Forbes. ^ Bomey, Nathan (July 7, 2017). "See the list: Sears, Kmart to close another 43 stores". USA Today. ^ Jones, Charisse (August 24, 2017). "Sears is closing 28 more Kmarts: See the list". USA Today. ^ "Santa Rosa Kmart Destroyed by Wildfire". MSNBC. October 12, 2017. ^ Gardner, Paula (October 17, 2017). Michigan Kmart store to close after holidays. Booth Newspapers. ^ Herbert, Geoff (November 3, 2017). "Sears, Kmart stores closing list: See which 63 locations will close next". Syracuse Post Standard. Retrieved November 3, 2017. ^ Gore, Leada (November 3, 2017). "The Last Kmart Store in Alabama is Closing". Birmingham News. ^ Thomas, Lauren (January 4, 2018). "Sears is closing over 100 more stores". MSNBC. ^ McIntyre, Douglas A. (2018). "10 brands that will disappear in 2018". MSN. ^ "Against all odds: Sears posts small profit". WESH. March 15, 2018. ^ Duprey, Rich (March 22, 2018). "Why You're Right to Ignore Sears Holdings' Profitable Quarter". Yahoo! Finance. ^ Peterson, Hayley (March 26, 2018). "'I'm not sure Kmart on its own could ever be a great retailer': Sears CEO makes a stunning admission about Kmart's viability in rare interview (SHLD)". MSN News. Archived from the original on June 12, 2018. ^ Therrien, Jim (May 10, 2018). "Kmart to close Bennington Square store". Bennington Banner. ^ Peterson, Hayley (October 15, 2018). "Sears is shuttering 142 stores, with liquidation sales starting immediately — here's the complete list of closing stores (SHLD)". San Francisco Chronicle. ^ a b Jones, Charisse & Tyko, Kelly (May 31, 2018). "How low can it go? Sears will close 63 more stores. Is yours on the list?". USA Today. ^ Hrushka, Anna (May 31, 2018). "Sears to close Hawaii's last Kmart store (Video)". Pacific Business Journal. ^ Doran, Elizabeth (June 28, 2018). "List of 10 more Sears, Kmart stores company announced it will close". Syracuse Post-Standard. ^ "Kmart in Oelwein to close". Waterloo-Cedar Falls Courier. July 13, 2018. ^ Mullins, Jeffry (July 12, 2018). "Elko's Kmart to close". Elko Daily Free Press. ^ Bomey, Nathan (August 23, 2018). "Another 46 Sears and Kmart stores closing in November: Here's the list". USA Today. ^ Bomey, Nathan; Tyko, Kelly (October 15, 2018). "Sears store closing list: 142 more Sears, Kmart locations closing in Chapter 11 bankruptcy". USA Today. ^ "List Of Sears Stores To Be Sold And Other Bankruptcy Developments". Seeking Alpha. November 23, 2018. Retrieved November 24, 2018. ^ Thomas, Lauren (December 28, 2018). "Sears is closing 80 more stores in March, faces possible liquidation". CNBC. Retrieved December 28, 2018. ^ Isidore, Chris (January 7, 2019). "If Sears survives, this is what it will look like". CNN. ^ Hirsch, Lauren (January 15, 2019). "Sears reaches deal with Chairman Eddie Lampert to save company and roughly 400 stores". CNBC. ^ "Sears Holdings Announces ESL Investments As Winning Bidder In Bankruptcy Court-Supervised Auction". Sears Holdings Corporation (Press release). January 17, 2019 – via PR Newswire. ^ Bomey, Nathan (January 24, 2019). "Ex-Sears CEO Eddie Lampert orchestrated 'scheme' to 'steal' Sears, creditors allege". USA Today. ^ Siegel, Rachel (January 28, 2019). "CEO's latest bid to save Sears would leave pensioners high and dry, government says". Washington Post. ^ a b Sinclair, Norm (July – August 2010). "Polyester Palace". DBusiness. Hour Media, Inc. Retrieved September 19, 2013. Kmart's headquarters in Troy was a study in inefficiency, as offices were spread among 23 modules, each three stories high save for one." and "One summer day in Troy in the early 1980s, a tall, thin man with a syrupy Southern drawl ambled into Kmart International Headquarters (KIH) at Big Beaver and Coolidge and signed in at the security desk. [...] the maze of 23 interconnected modules that made up Kmart's sprawling headquarters. ^ "Kmart closing Sardis Road store". Charlotte Business Journal. March 8, 2002. ^ Treece, James B. (January 17, 1994). "Kmart: Slick Moves Or Running In Place?". Businessweek. ^ Johnson, Ben (December 2, 1982). "Haute Kmart: Designer Depot caters to economy-minded". Detroit Free Press. p. B1. Retrieved August 21, 2018. ^ "KDollar". Trademarkia. n.d. Retrieved December 23, 2012. ^ Kovanis, Georgea (February 3, 2013). "Can Kmart's KDollar compete in metro Detroit discount shopping mecca?". Detroit Free Press. Archived from the original on July 16, 2013. ^ "Kmart Corporation". Funding Universe. n.d. Retrieved August 1, 2008. ^ "Yes, There Really Is A Dentist's Office In A Kmart In Miami". Retrieved January 16, 2019. ^ Davis, Andy (June 6, 2017). "Iowa City Kmart to close in September". Iowa City Press-Citizen. ^ Lippman, Thomas W. (June 14, 1982). "Makro: 'Nothing Else Like It'". The Washington Post. ^ Yoshihara, Nancy (January 15, 1985). "K mart to Buy Pay Less for About $500 Million". Los Angeles Times. ^ White, George (December 3, 1993). "Kmart to Sell Payless Chain to THC Corp.: Merger: With $1-billion deal, Thrifty's parent firm will become the nation's second-largest drugstore retailer". Los Angeles Times. ^ "Kmart At A Glance". Kmart. n.d. Archived from the original on October 20, 2008. ^ Elliott, Stuart (October 4, 1979). "Kmart testing entry". The Detroit Free Press. ^ Willis, John M. (November 14, 1993). "Kmart discount outlet to open in West Rome". Rome News-Tribune. Rome, Georgia. p. 5 – via Google News. ^ "Variety Outlet opens here". Rome News-Tribune. January 10, 1994. p. 6 – via Google News. ^ "Kmart for kids". Kmart. n.d. Archived from the original on October 6, 2009. ^ "Kmart for kids: What is the March of Dimes?". Kmart. n.d.
^ "Kmart". March of Dimes. n.d. Retrieved November 2, 2014. ^ "Four Named to March of Dimes Board of Trustees". March of Dimes. July 29, 2008. ^ "Kmart Is Warming Up the Holiday Season with Increased Donations" (Press release). iStockAnalyst. December 18, 2008. Archived from the original on July 13, 2011. Retrieved October 22, 2012. ^ "Kmart Raises Record $21.9 Million for St. Jude Thanks and Giving Campaign" (Press release). PR Newswire. February 6, 2014. Retrieved April 22, 2014. ^ "Kmart Earns Outstanding Corporate Citizen Award" (Press release). iStockAnalyst. September 25, 2008. Archived from the original on July 13, 2011. Retrieved October 22, 2012. ^ "Kmart Consent Agreement and Final Order". EPA. May 9, 2007. Archived from the original on October 10, 2007. Retrieved May 6, 2008. ^ "Lawrence, Kan., Distribution Center Among Those Costing Kmart $102,400 in Environmental Penalties, But Self Reporting Reduces Fine". Webwire (Press release). May 11, 2007. Retrieved May 6, 2008. ^ "Kmart continues battery recycling". The Reporter. Conway, New Hampshire. April 24, 1991. p. 13A – via Google News. ^ Halverson, Richard (June 18, 1990). "K mart launches battery recycling". Discount Store News. Archived from the original on September 21, 2008. Retrieved May 6, 2008 – via FindArticles. ^ Codispoti, Amanda (March 6, 2012). "Sears and Kmart receipts go digital". The Roanoke Times. Archived from the original on February 16, 2013. Retrieved February 1, 2013. ^ "Walmart Cruelty: The Hidden Cost of Walmart's Pork". Mercy For Animals. n.d. Retrieved September 4, 2012. ^ Runkle, Nathan (July 18, 2012). "Victory! Costco and Kmart Commit to Ditching Gestation Crates Following MFA Investigation". Mercy For Animals. Archived from the original on August 22, 2012. Retrieved September 4, 2012. ^ "Darrell Waltrip". NASCAR Digital Media. n.d.
^ Hopkins, Philip (October 20, 2010). "Kmart's first home gets special treatment". Sydney Morning Herald. Retrieved January 21, 2018. ^ "Kmart celebrates 20 years in New Zealand". Scoop. October 14, 2008. ^ "21.5% Stake In Coles Myer of Australia is Ended". New York Times. November 5, 1994. ^ Carson, Vanda (July 2, 2007). "Wesfarmers buys Coles". Melbourne Age. ^ Worden, Amy (July 28, 1994). "When the doors closed at the last S.S. Kresge..." United Press International. ^ "Kmart Canada to Close 10 Stores, Fire 756". Los Angeles Times. December 30, 1997. ^ "Hudson's Bay Is Taking Over Kmart Of Canada". New York Times. February 7, 1998. ^ "Hudson's Bay to shutter 40 Kmart Canada stores and convert 59". Home Furnishing Network. March 9, 1998 – via The Free Library. ^ a b Wilkinson, Bert (February 19, 2002). "New Kmart In Trinidad Runs Into Red Light". Fort Lauderdale Sun Sentinel. ^ Dixon, Jennifer (June 25, 2002). "Kmart kept building in Caribbean despite major U.S. problems". Billings Gazette. ^ Toth, Robert C. (May 8, 1992). "Kmart Buys Up a Dozen Department Stores in Czechoslovakia". Los Angeles Times. ^ "Kmart Plans to Sell Czech And Slovak Stores". New York Times. March 6, 1996. ^ "Kmart quits Czech and Slovak republics: Kmart Corp. is..." Chicago Tribune. March 5, 1996. ^ "Kmart-El Puerto plan joint retail venture in Mexico". United Press International. December 21, 1992. ^ Ramey, Joanna (May 18, 1994). "Kmart Ready for Mexico City". Women's Wear Daily. ^ "Kmart Pulling Out Of Chain Of Stores In Mexico". New York Times. February 21, 1997. ^ "S.S. Kresge - American businessman". Encyclopædia Britannica. ^ Northup, A. Dale (2003). Detroit's Woodlawn Cemetery. Arcadia Publishing. p. 60. ISBN 9780738531564 – via Google Books. ^ a b c Kresge, Stanley Sebastian; Spilos, Steve (1979). The S. S. Kresge story. Western Pub. Co. p. 370 – via Google Books. ^ ""Expansion Day" to be Observed at Kresge Store". Freeport Journal-Standard. September 24, 1941. p. 15. Retrieved July 10, 2017 – via Newspapers.com. ^ "Kresge to Celebrate "Expansion Day"". The Times Recorder. May 28, 1942. p. 9. Retrieved July 10, 2017 – via Newspapers.com. ^ Chain Store Age. Chain Store Publishing Corporation. 1946. p. 286 – via Google Books. D. C. Fisher elected president of S. S. Kresge ... Mr. Fisher, who entered the company in 1907, succeeds Robert R. Williams, who has retired after serving as president and general manager for the past eight years. ^ "Elected Kresge Head". Sandusky Register. May 9, 1953. p. 2. Retrieved July 10, 2017 – via Newspapers.com. ^ a b "Cunningham Named Kresge Board President". The News. May 12, 1959. p. 17. Retrieved July 10, 2017 – via Newspapers.com. ^ a b c d e f g h "History of Kmart Corporation". FundingUniverse. Retrieved July 10, 2017. ^ a b c d "Kmart names new CEO". United Press International. January 20, 2003. Retrieved July 10, 2017. ^ "Julian C. Day: Executive Profile & Biography". Bloomberg L.P. Retrieved July 10, 2017. ^ "Profile: W. Bruce Johnson". Forbes. n.d. Archived from the original on December 7, 2008. Turner, Marcia Layton (2003). Kmart's Ten Deadly Sins: How Incompetence Tainted an American Icon. Hoboken, New Jersey: John Wiley & Sons. ISBN 978-0-471-43593-8. Archived from the original on February 18, 2012. Retrieved September 30, 2011. How Kmart Went From Beating Walmart And Target To Bankruptcy. CNBC. December 20, 2018. Wikimedia Commons has media related to Kmart.